Yesterday, the control center of the Dawn space probe mission has received confirmation that the spacecraft got out of the giant asteroid Vesta’s gravitational field and has regularly made en route to the dwarf planet Ceres. The Dawn space probe remained in the vicinity of the giant asteroid Vesta for almost exactly a year analyzing it with its instruments and sending huge amounts of data to the control center on Earth. 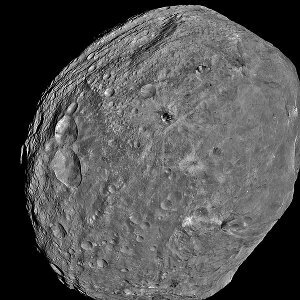 Vesta is the second largest body in the asteroid belt between Mars and Jupiter and in the last year Dawn has progressively discovered its extraordinary and violent history. The information obtained on the giant asteroid Vesta make scientists think that it’s a protoplanet, a kind of fossil of the early history of the solar system, and it’s possible that its classification is revised and it gets included among the dwarf planets. The Dawn space probe is equipped with a xenon ions propulsion system that can achieve a reduced thrust but can be used for long periods to direct it to each destination. For example, Dawn took over a month to get out of the giant asteroid Vesta’s gravitational field and begin its journey towards the dwarf planet Ceres. There was a delay on the original schedule because of a problem with one of the reaction wheels of the Dawn space probe, which is part of the system that allows the spacecraft to orient with accuracy. The wheel had developed excessive friction so it was turned off. A similar problem happened with another reaction wheel in June 2010. The Dawn spacecraft can use its thrusters to orient but the wheels system is powered by solar panels, which are a renewable power source, while the available xenon is obviously in a finite quantity. However, the spacecraft needs enough propellant to reach Ceres and to change its orbit around that dwarf planet to study it properly. NASA engineers believe that Dawn can conclude its mission without using the reaction wheels but of course it would be better to use this system saving the propellant for other contingences. The first part of the mission of the Dawn space probe has already paid off handsomely and the analysis of the data obtained will help to unravel the secrets of the formation of the solar system and, consequently, of the Earth. The arrival of the spacecraft in the vicinity of Ceres is scheduled for February 2015 and NASA scientists already expect more surprises.